What are some of the ways that we can make the world a better place? "Plant flowers and pick up trash." "Plant appleseeds to make trees." "Help around the world and not argue with people. And pick up trash." "Picking up litter from the beach." This year for International Day (our local version of "Thinking Day"), we are joining with our sister Brownie troop to represent Guatemala. Our Daisy troop is baking a Guatemalan banana bread recipe to serve as a snack. 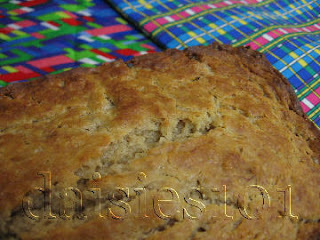 This banana bread freezes well -- excellent for making ahead of the event! Preheat oven to 350 deg. F. Lightly grease a 9 x 5-inch loaf pan. Cream the butter and sugar in a large mixing bowl until light and fluffy. Mash the bananas and add to the butter and sugar mixture. Add the salt, cinnamon, lemon juice, and egg. Sift the flour with the baking powder in a medium bowl, and fold it into the liquid mixture. Pour the batter into the prepared loaf pan and bake for 1 hour, or until a cake tester comes out clean. Serve with honey as a cake bread, or as a dessert with cream or ice cream. Adapted from a recipe at Mayan Traditions. What does it mean to be considerate and caring? You think about other people, about their feelings. "You wouldn't hurt them. You take care of them when they get hurt." "Never laugh when somebody gets hurt." "Take good care of them when they get sick." What is courage? Being strong when you are afraid, when things are difficult. What do you think it means to be courageous and strong? "When something is heavy and you can pick it up." "(My dad can pick up a small house.)" "I do swimming and kung fu and karate." "I was afraid to go in the pool the first time." What about going to the dentist? "I love the dentist." Our first service project was for Color a Smile. This organization collects drawings from schoolkids and Scouts like us, and donates them to nursing homes, Meals on Wheels, etc. We spent our activity time at this week's meeting in coloring over twenty pages! Our Daisies are welcome to print out pages at home and bring them to the meeting for service credit. Please keep track of the time you've spent coloring, so that you can record it on your Inchworm of Service record and earn your next patch! The Inchworm of Service patch program is one of the ways in which GSCOC encourages Girl Scouts to provide service to our families and communities and teaches girls the value of helping others. Girl Scouts at all levels keep track of their service hours on the Inchworm form, and after completing the required number of hours they will have earned a patch, which they can wear on the back of their tunic or vest. The first patch is the head of the inchworm. Girls can earn as many Inchworm patches as they are able. 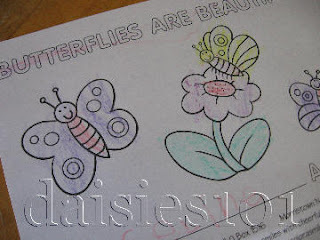 Daisies are required to complete 5 hours of service in order to receive a patch. Service time can be earned as a troop or at home. Record your Daisy's time in 15-minute increments -- each Inchworm section on the form stands for 1 hour. More information and printable Inchworm forms can be found here. 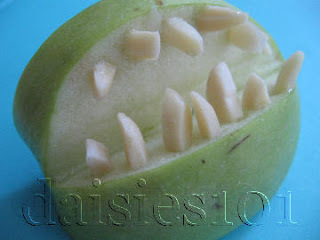 Here is a silly snack that we made the week of Halloween -- the idea is from the October 2007 issue of FamilyFun magazine, and can also be found here. box or plastic bag to take home the apple trimmings for your compost pile! 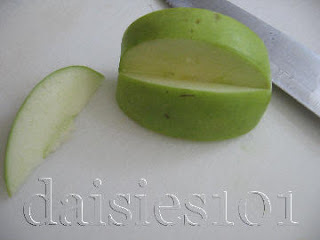 One of the leaders can cut each apple into quarters. Core the quarters, and cut out a wedge from the skin side of each quarter. This makes the "mouth". Have the girls press the slivered almonds into place for "teeth," at the top or bottom or both!